Use this link to join our email list. Please feel free to leave a message. If we’re unavailable, we will return your call within one business day. We appreciate your business! NEW HOURS as of April 22, 2019. Please see below. Inclement weather policy – Please note that we follow the Greenville County School policy. Check your local television news for closing announcements. During weekends and school holidays please call the office before venturing out to check if we are open. Stay warm and stay safe! Our practice continues to thrive and grow as we serve our established and new patients. We truly appreciate your patronage. Please see our current office hours below. To better serve you, we have added community hours on Wednesday. Se habla español! – call 864-406-3800 to confirm availability. Acupuncturists Nicole Negron, MS, LAc and Hope Dennis, LAc are here for community style acupuncture. Nicole is also available for private appointments. Our most recent addition to our practice is Lindsay Culbert, CR. Lindsay specializes and is fully certified in Foot Reflexology. For more information visit her website or call 864.245.1586. We have teamed with Wellevate, an online pharmacy, to better serve you. When you sign up through our practice, you will receive an invitation to join. The next steps are to set up your profile and begin exploring the products offered. You can order from home and request recommendations from one of our practitioners. We will add them to your account to assist you in the products to better meet your healthcare needs. Please note that no appointments are taken or required during community hours. Each client will be treated on a first come basis. Cupping therapy is an ancient form of alternative medicine in which a local suction is created on the skin. practitioners believe cupping mobilizes blood flow in order to promote healing. Cupping is effective for relieving pain, relaxing muscle spasms, increasing local blood circulation, and detoxifying local tissue. It is also used to treat common cold. Will cupping leave marks on the skin? Yes, cupping will leave temporary marks on the skin. The marks resemble bruising, but are not painful. They are the result of bringing blood and toxins to the skin surface. The color of the marks can range from pink to red to dark purple, depending on your condition. The marks can last up to several days, and to help reduce this duration it is important to drink plenty of water after your treatment. Can I get burned during cupping? The flame used to produce suction is removed before placing the cup on the skin, and the cup will not be hot when it touches the skin. 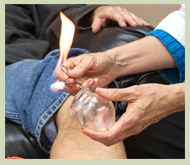 Cupping is performed under a controlled environment so that there is very little risk of getting burned. Affordable Acupuncture by Joan. 2012-2019. All Rights Reserved.